The Kasoa Divisional police, led by Assistant Commissioner of Police (ACP) Agyeman Adjem, have apprehended 130 suspected criminals in a special swoop conducted at dawn yesterday in some areas suspected to be dens for criminals. 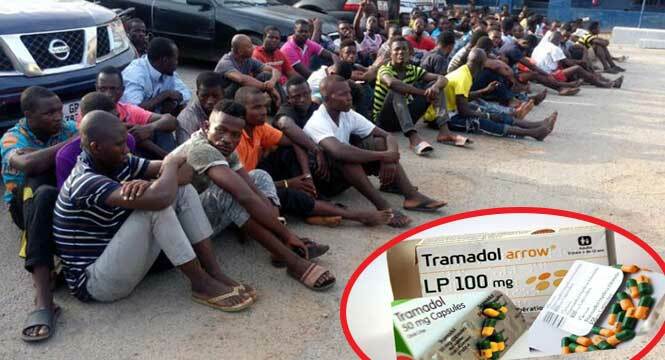 Some quantities of whitish substance suspected to be cocaine, Tramadol capsules and quantities of dry leaves suspected to be Indian help (wee), were recovered from the suspects. In addition, three suspected criminals who are on the police wanted list for allegedly committing various offences, including robbery, were also apprehended. Briefing DAILY GUIDE, ACP Adjem said due to the increasing number of criminal activities at Kasoa and its environs, the division, with the help of the regional command and personnel from headquarters, conducted the operation mainly at Budumburam where the suspects were said to be hiding. He said the suspects were apprehended randomly and would be screened and those found culpable would be prosecuted. “Some criminals have used Kasoa as their safe haven but we shall make the area uncomfortable for them to live and conduct the nefarious activities,” ACP Adjem assured. He also called on the public to assist the police with information about the hideouts of people suspected to be criminals. ACP Adjem said the identities of such informants would be kept secret.